When it comes to choosing a material for countertop applications, the “best” selection is completely dependent upon the preferences and expectations of those who will be using the surface. With so many options available, from white marble, to quartzite, to porcelain slabs, it’s important to understand how the countertop will be used and how those using it feel about the appearance over time, as well as ease of maintenance. Some people prefer a surface that will remain relatively unchanged over time, while others enjoy the inherent imperfections that come along with many natural materials. Or, as we like to say, they appreciate that natural materials are perfectly imperfect. In this guide, we’ll help you determine what to expect with various countertop materials, so you can make the choice that works best for your project. All natural materials are perfectly imperfect. In our first example… When renovating their apartment, a couple decides to incorporate elements that reflect their travels. They display art from Paris, dishes from Prague and bring in white marble reminiscent of the countertops they saw in Italy. They use their countertops to cook and dine. Over time, spaghetti spills from plates, etching the surface, red wine splashes from glasses, leaving marks, and coffee forms rings. Dishes are passed, slightly scratching the surface. Marinara sauce (an acidic food) wears away and dulls the finish. Olive oil begins to patina the surface. To this couple, the white marble doesn’t look worn or imperfect. It looks authentic and natural. When a person expects to see the inherent characteristics of natural stone become more apparent over time, they are generally happy with white marble. Now let’s look at another example… A couple renovates their home. They purchase new, modern furniture and appliances and install a 10’ island in their kitchen. 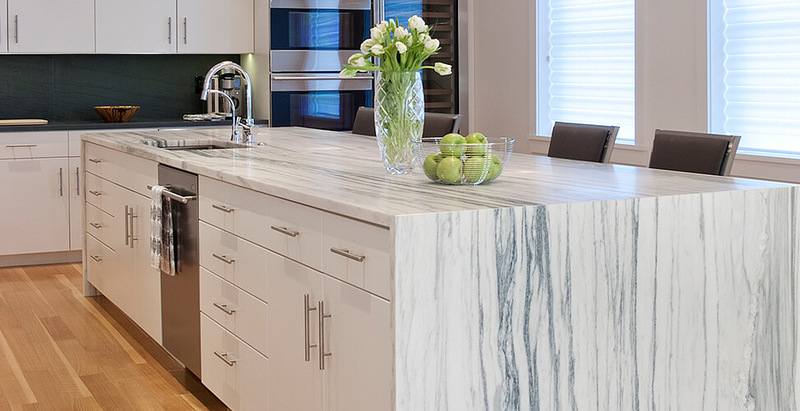 The island boasts beautiful white Italian marble with a very crisp white background and deep gray veining. The couple views the countertop as “art”. The island becomes the area where family and guests gather. Just as we saw in the first example, wine spills and stains the counter, lemonade splashes on the surface and etches it, and platters drag across the surface and scratch it. The couple, who wanted a pristine countertop for their pristine home, becomes disappointed with their selection and is frustrated to learn about the maintenance required to restore it.When a person expects their kitchen countertop material to look relatively the same over time and wants a material that will require less maintenance, they are generally happy choosing an alternative to white marble. SAME STONE. DIFFERENT PEOPLE. DIFFERENT EXPECTATIONS. DIFFERENT PERCEPTIONS. Marble, unlike alternatives to marble (quartzite, granite, schist, sandstone, basalt, engineered stone and porcelain slabs), will scratch fairly easily (it has relatively low abrasion resistance). Due to its light color and porosity (it has moderate to high porosity), stains from red wine and other highly-pigmented liquids are likely to remain on the surface, especially if the stone is not sealed and/or the surface is not wiped immediately. However, removing wine stains from marble is relatively easy to accomplish. It will etch when exposed to acidic foods such as lemons or tomatoes. This etching is less apparent on white marble and more apparent on dark marble. Therefore, dark marble is not ideal for kitchen countertops. Etching is also far more apparent on polished than honed surfaces. NOTE: If you are considering using a polished marble, you may want to use it only on surfaces that do not come in contact with food or drink. Or you may choose to have the marble honed in a fabrication shop. 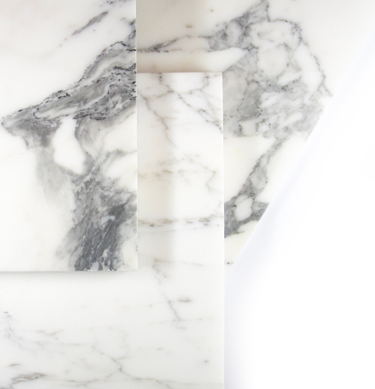 Although steps can be taken to minimize the appearance of these characteristics, these signs of wear will occur on every marble, without exception. Basalt is a porous material with naturally-occurring holes that may remain unfilled or may be factory-filled with resin or cement. Basalt will stain when exposed to oil and highly-pigmented liquids. While generally hard and dense, some granites have higher absorption and/or lower abrasion resistance than may be expected. Some granites are resin-treated to enhance the color and fortify the surface of the stone. Some quartzites have a high absorption rating and will stain when exposed to oil and highly-pigmented liquids. Due to the high abrasion resistance of quartzite, it can be difficult and expensive to fabricate. Most quartzite has naturally occurring cracks and fissures. All sandstones have medium to high absorption ratings and have a medium to high abrasion resistance rating. It will stain when exposed to oil and highly-pigmented liquids. All schists have a moderate absorption rating and will stain when exposed to oil and highly-pigmented liquids. All schists have a low abrasion resistance rating and are likely to scratch. Always seal marble prior to use. To reduce the appearance of etching in kitchen countertop applications, choose a honed, white marble with a low-moderate absorption rating. To reduce the appearance of staining, always wipe up spills immediately. Oil and highly-pigmented liquids can penetrate and stain the stone and may need poultice to remove the stain. Always use a neutral detergent to clean marble. Always check the abrasion resistance rating. For marble with a lower abrasion resistance rating, expect the material to patina. If acid etching is an issue, choose a material with a minimal acid sensitivity rating. Expect to see factory-repaired cracks and fissures. The quality of the repair is dependent upon the factory of origin, the fabricator of the stone and the installer. Always seal stone material prior to grouting or use. To reduce the appearance of staining in kitchen countertop applications, always wipe up spills immediately. Oil and highly-pigmented liquids can penetrate and stain the stone and may need poultice to remove the stain. Do not use resin-filled material outside, as the resin will discolor over time. Choose cement-filled or unfilled materials as an alternative. Always check the absorption rating. Always check the abrasion resistance rating. Always use a grout that is similar in color to the stone to avoid a picture-frame effect. Laminam 12+ requires no sealer. It can be used outside for countertops and requires minimal maintenance beyond cleaning the surface. It’s engineered to look like marble, concrete, metal and solid surfaces. 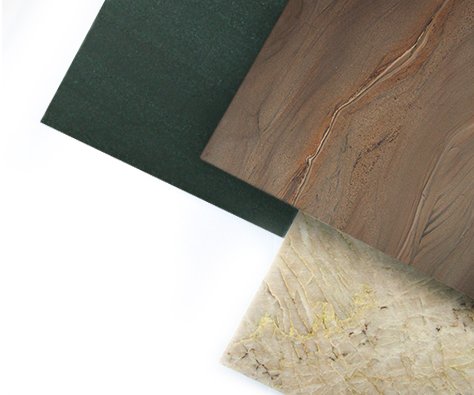 Each of these popular countertop materials is stocked in one or more of our warehouses. Availability is subject to change, so please contact your Stone Source Representative for current inventory levels.